The Learning Tree Education Center is conveniently located at MicroTek's Washington, D.C. training facility. 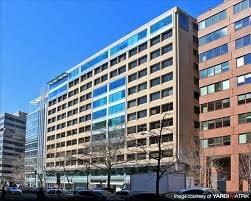 The building is in the heart of downtown near the White House, US Treasury and other government agencies. Parking garage is attached to the building. The entrance to the garage is located on Vermont Ave.
Yellow Cab (202) 544-1212 Please Note: The easiest and fastest way to catch a taxi in DC is to hail a cab from the street corner. Please note that most cabs only take cash in the DC area. The average cab ride from the MicroTek facility to Union Station is approximately $11.00. Less than a five minute walk to MicroTek! Make the Washington Plaza your home away from home-consistently ranked in the top 20 hotels in DC and noted for their personal service and excellent customer reviews. Call 202-842-1300 and request the MicroTek rate.